Hatastic has won the Folksy Fashioning Technology competition! You can find out how to make one for yourself here. 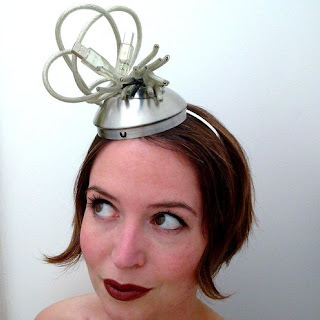 Don't forget to check our Hatastic's slightly more mainstream fascinators in her Folksy shop. Oh such a wonderful creation - a winner in my book too. Congrats! he he I love it, fantastic hat. Haha, that's great. Well done Hatastic! Well done Hatastic - a fascinating fascinator indeed!